Fzsteve Night riding glasses to take off the glare. 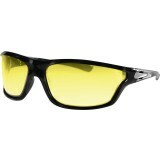 "Needed these for night time riding take glare off off on coming headlights. Work nice just wish they didn't have the inner rubber part on the arms cause when trying to slide in when the helmets on kinda tough.but can't beat price and they do work good at night."